And just a little while ago, while I was out watering the garden in the still, evening shade, I looked over and saw something amazing in that very same scene--a wild hen turkey leading a procession of at least five baby turkeys back and forth across the grass, just beyond the fence. The stuff of life--oh yes. Wow! That is just gorgeous! I'm with you on being amazed at where I live. I was up at dawn this morning and the valley was carpeted with this fog that roiled between the tracery of cool streams and the heat of the rising sun. As River ran outside something large (eagle probably, all I saw was a shadow and a bird flying into the sunrise) was spooked and flew over the house and away. Our yearling deer are out but I've not seen this year's fawns yet...any day now. This photo is absolutely stunning! Your photography and tales are interesting and inspiring and I just love your site. Your picture is wonderful. Do you have idea what kind of butterfly that is? What a delight for you to look up and see the turkey family trotting thew your lawn. This picture is truly fantastic! That photo is fab! I still get all ooh and ahh when I see a rabbit here or there...a family of turkeys would positively have me running for a camera! I recently saw some amazing butterly jewelry (made after the butterflies "naturally transpire" that capture that wonderful blue irridescent sheen. Have you read the book Maine,a year of country life? It is one of the most beautiful books. It was written by Stanley Joseph and Lynn Karlin. They bought the old Nearing farm( Good Life). This book is a great example of how to blend essays, photography, recipes, and gardening into one heck of a book. I would be more than happy to send you a copy to a post office near you. Wow - that truly is the stuff of life. You have such a wonderful point of view. I used to be out on the farm (now displaced)and I can't describe what your blog has done for me. I had gotten away from seeing the "simple things" for a while...after reading here, my eye for the "stuff" has returned. Thank you! Wow Susan, that photo is utterly stunning! Belated Happy Birthday to you, will send email with goings on round here soon but had to stop by and say Wow! Surely good enough for any competitions that you come upon, an absolute cracker. Bev. Fabulous shot! That's worth framing! Nature is so awesome! Love this one today! What a lovely blue butterfly. God is good. Enjoy your farm and thanks for letting us all live it vicariously through you! Thank you so much. And thanks for taking the time to write. You know, I actually have no idea what kind of butterfly that is. There are a fair amount of them flitting around the garden, though, so it must not be too rare. Yes, it was a real treat to see that turkey family. For a few years there were two families that would come out together, and I was afraid they had moved on. Once we were even treated to flying lessons. That was hysterical. Those birds don't even look like they can fly (and sometimes, when I come upon them in the woods and they start jogging down the road--I wonder if they forget that they can--or that it's simply easier to run than try to get liftoff!) The babies were doing pretty well for the most part, but I saw one go up and then thud! right back down. So sad--but really funny, too. And I'm sure it wasn't hurt. Well welcome to the farm! Thanks for taking the time to say hello. And yes, come back and e-visit anytime--all of the fun and none of the work! That butterfly jewelry sounds positively intriguing. P.S. So glad you made it to Colorado and are blogging again! Oh, such good news that your garlic has sprouted! As a matter of fact, that is one of my favorite books, and I have been meaning to mention it and add it to the (so far nonexistent) "On My Bookshelf" list in the sidebar. I have owned my cherished copy since 1991, and boy did I read it a lot between then and moving to the country in 1994. Definitely the stuff of dozens of daydreams. (n fact, Maine was on the list of Places That Sound Really Wonderful.) You are right--it's a fantasic combination of elements all bundled up into one inspirational package. I was shocked and saddened to hear a few years ago that Stanley Joseph had passed away. I don't know what happened to him--do you? Does Lynn still live on the farm? Oh, I can't tell you how many times I've flipped through that book. And thank you so much for the kind offer to send me a copy--you are too sweet. And you certainly have good taste (and know mine)! Yes, full grown wild turkeys can get pretty large--especially the males when they have their wings all out (I am blanking out the technical term for this, which will get me no end of hassling from Joe when he reads this, LOL) because we see them do it all the time. They will strut back and forth in the hayfield showing off for the girls. It is super. Hearing that I inspired someone in some special little way--whether it was deciding to plant some lettuce seeds for the first time, or digging up half their yard and turn it into a vegetable garden, or finally getting up the courage to try baking a batch of scones, or simply starting to look for the simple things again. I can't even begin to explain how wonderful that makes me feel. Thank you. Okay, by this point I am now tryingon the wall where I could hang an enlarged print of this photo. I'm thrilled it has been so popular! Thank you, and you're very welcome! From what I have read Lynn and Stanley divorced shortly after the book was released. I knew Stanley had died. So sad,but I dont know how it happened. Lynn does garden photography for a living. I think She has a web site. Hopefully one day I will be able to put one of your books on my shelf, right next to Stanley and Lynn's book. Oh, I love this picture; it's so gorgeous and the butterfly/flower is/are wonderful!!! I love your blog! Haven't left a message till today, just had to say what a beautiful butterfly that is! Turkeys.. my son lives in Oregon, in the forest, and wild turkeys are everywhere! He and his girlfriend love to watch them. 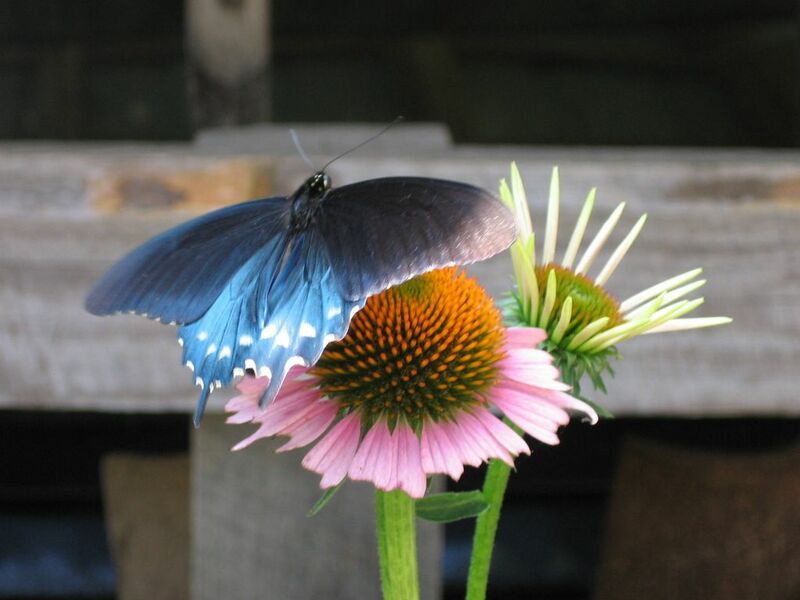 My friends, the butterfly experts (and they actually are published on the topic) say it's probably a Pipevine Swallowtail, although there are others who are in a "mimicry ring" with them so there's a small chance it's one of the mimicers. I'm going to a presentation of theirs tonight, so maybe I'll have more tidbits tomorrow. This is the most gourgeous picture I have seen! Hope you don't mind-it is on my desktop to remind me that spring really is not that far away!